Oman has a large Indian population due to its close proximity to India and a high labor requirement. It is very much normal to see Indian expats all over the Sultanate of Oman and very much in the capital city of Muscat. Almost every office, company, restaurant or shopping mall, an Indian is easy to spot working. Basically Oman has a lot of shopping centres and hypermarkets where you can get almost everything and even more than what you get in India. The price difference between the two countries may vary but some don’t so you should be careful what you put in your luggage bag while you pack for Oman. Well, basically International flights to Oman has a luggage allowance of 30 kgs and Air India has 40 kgs so it is worthwhile to shop a little in India and pack to Oman. Here is a guide and checklist of what to carry when you fly off to Muscat airport. 1. Documents and Papers: This is very important and you should be careful that you carry all your necessary documents and papers while you’re in India. Also take several copies of passport sized photographs as you maybe requiring it often and would be easy for you if you carry those from home. Make a checklist of all necessary documents like your passport, educational documents, experience certificates, etc that you may be needing and pack it in your hand luggage. 2. Laptops and Electronic Devices: If you already own a laptop or a cellular phone then you can carry them to Oman as well. The prices of electronic devices are basically the same in India and Oman though the rates are a little higher in Oman than India. There are only few brands of electronics that are cheaper in Oman so it is better to buy one in India before reaching Oman. But of course, you can buy very good quality second hand items which includes laptops and cell phones in Oman at good rates from online classified sites like Dubizzle. Chargers for your electronic devices may not be compatible with plug points in Oman but a lot of plugin extensions are available in Hypermarkets so it won’t be much of a problem. 3. Clothes and Shoes: There are amazing showrooms and shops from various luxury brands all over Muscat and other parts of Oman where you can shop for clothes but the clothes are expensive too. If you want some decent clothes then it is better to buy few in India what you require, probably pack some casuals and formals whatever you need. Oman has a very hot climate and it is very hot all over the years especially the summers so make sure you pack good summer clothes with you. Oman has a lot of beaches so make sure you also carry some great beach wear for yourself. Rates of clothes and shoes from brands like Adidas, Nike, woodland, Allen Solly, Benneton etc is cheaper in India so it is advisable to buy in India and later once you’re settled and used to with Oman, you can spend some good time shopping in Oman once you’ve moved. Oman gets a little cold though not very cold in the winters so you may carry thin sweaters, jackets and coats as well that you may be requiring in the colder months like December, January and February. 4. Food: Indian food and ingredients won’t be missed in Oman as it is readily available everywhere in the country. Once you move to Oman, you will see that you will find tons of Indian restaurants and fast food joints across the city. All hypermarkets have Indian food ingredients, species and also Indian brand snacks so carrying it from home would not be necessary as there are plenty available in Oman itself. 5. Indian Souvenirs: It is always great for you to carry little souvenirs from India that would remind you of home. Once you start working and living in Oman, you will definitely meet and be friends with people from various nationalities and ethnic backgrounds. So delighting your new friends with these souvenirs as little gifts would be really impressive and courteous as well. 6. 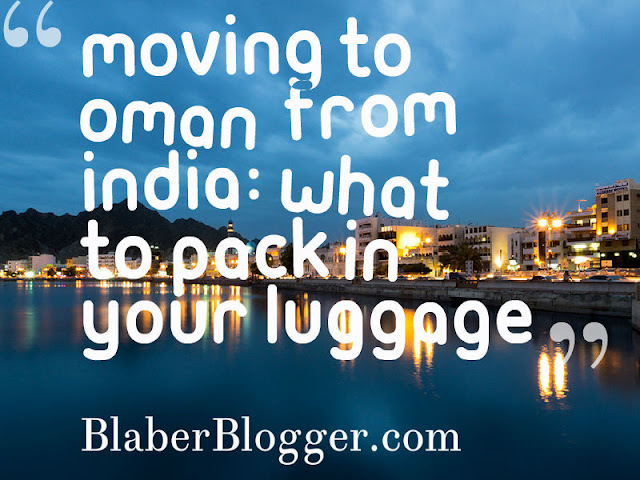 Miscellaneous: There are few things that is available in Oman but you could carry it with you from India so that your initial days won’t be busy shopping as you need time to settle down and adjust in the new country. Carry your essential toiletries in a zip lock bag, a good sun block, good sun glasses, caps and scarfs would be beneficial.